Thread: Dying in a village. Wife's grandmother, ID cards says 110 years old, but you can take that with a grain of salt, born before births were registered. She has been in hospital for awhile, not much the doctors can do, just too old. She called it a day, go home and die, family, 8 sons I think, grandchildren, great grand kids and great, great grand children all come to say their goodbyes..She will be dead by the morning. This is not unusual around here, old people will call the family, say their goodbyes, it's like they have an off switch and are dead by sun rise. No one really seems sad about the loss, she's old and moving on to the next life, hope I can go the same way, die in my own bed, no strange doctors and nurses and IVs in my arms. Don't know where the off switch is yet. Same thing with my MiL. Very civilized. She went with dignity and a smile on her face. And usually wise and dignified beyond their years. The stories they could tell. Wife's grandmother,... has been in hospital for awhile, not much the doctors can do, just too old. She called it a day, go home and die, it's like they have an off switch and are dead by sun rise. The doctors tell them there's nothing more they can do .. go home and spend your last hours with your family. And they do. Something to be said for Thai acceptance of death as part of life. Those I know who have passed in the village and city have done it quietly and with dignity, no fussing or hysterics by family, bbq two days later and life goes on. No the doctors tell them they can live longer on an IV in a hospital, weeks, maybe a few months.. Better to got into the night with family than with strangers, some out here have never been to a doctor and just know it's their their time to go. Think perhaps I have become a little bit too Issan, new life is awaiting. Sounds the best way to leave this life, to me. Much more comforting than passing away in the company of strangers at a hospital. One thing I wonder about, though. So many Thai people are concerned with bad luck left in places where people pass away. They don’t want to live in a place where someone has died and therefore don’t want anyone dying in their house. Is it the case that Mrs. Collister’s grandmother is to die in her own house which makes the difference? What makes this family cast aside superstition? Family member dying in the house has never been an issue as far as I am aware. No-one likes to live in a house where someone unknown has died, especially if they don't know how. Funny how so many cultures have a fear of ghosts and spirits wandering around until their mysterious death has been solved. Sounds very much like the Aboriginal "pointing of the bone". The shaman points a bone at a person, they will die. It's believed, thus it happens. Psychosomatic. That would be nice to know, eh. What makes this family cast aside superstition? The death of an elder is an almost daily occurrence in our village. Usually with minimal, if any, medical assistance. The whole culture of the village seems to be based upon the Buddhist rituals and social customs concerning death. Village women assist in food preparation and service for guests at the daily rites. Music blares at dawn and dusk. Firecrackers go off, sending dogs into hiding places. A common fund exists for help with expenses for villagers who are without means. Sometimes these things go on for days depending on the status of the individual who has passed. Death is accepted as part of the normal rhythm of life and plays a vital role in a culture that binds the village together. The horrific thing about passing away in the company of strangers at a hospital would be if (as happened to my grandfather in an ambulance) some Christian tried to push their religion down my throat whilst I was in a very weak state. some Christian tried to push their religion down my throat whilst I was in a very weak state. So when someone dies at home it's natural for the family to grieve, and then invite the monks round for chanting and a splash to dispel evil spirits, and everything returns to normal. Never got around to asking if this cleansing also scares off the worthy and virtuous spirits of the deceased. Sounds cynical but death is part of life, and every culture and belief system thrives on the spin that real and perceived negatives can be remedied with a contribution to those endowed with knowledge of the unknowable. Can't say I understand the ghost thing all that well, but seems if you die of old age in a house that you lived in, or were born in for a much of your life, that's a good luck house. Strange customs out my way, die of old age get burnt, die young from unnatural causes, IE shot, murdered, vehicle or other accidents, then you get buried for a number of years, then you have ghosts. Common misconception, Buddhism does not believe in re incantation to this world. People out this way, although allegedly Buddhist, believe in nature spirits, ghosts, magic trees, some trees can even speak , magic spells etc. Ghosts used to walk up and down the street at night, dogs would bark and soi dogs [dingos can't bark] would howl, less ghosts now that we have electricity and street lights. From my understanding, Theravadists draw a thin line between reincarnation and rebirth - so thin, they're virtually identical to the novice. Then there's the blending of other "little" traditions such as animism, etc. Thailand is a real melting pot religious wise. My Mrs will not eat Beef, ask her why she doesn't know the reason. My view is that in chronological order Thailand was Animist, Hindu and then Buddhist. I think the beef this is a hangover from the Hindu influence. You are right about the spirit thing, its all pervasive in the sticks. Thais are a kind of bunch of religious magpies, they like the shiny things and accumulate the what they see as the best from a range of religions. ^ Wonder if your Mrs knows anything about a female monk (now deity-like? )..., usually a small statue amongst the rubble of knick-knacks (can't remember the non-beef chick's name) who forbids beef in the household. She's Chinese. 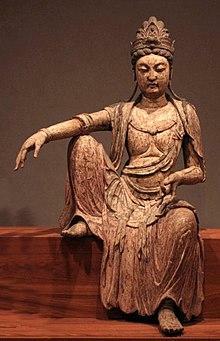 Guan Yin. But yes I can see why anyone might assume her to be Hindu. There's a temple devoted to her in Hatyai. A few schools that I've seen will have a statue of Ganesha, being the patron of education. Down south here the animist traditions are still widely respected, with absolutely no conflict with Buddhism (which is fair enough). Lots of little offereings to trees, and many shops still put out on the footpath a food offering every day, with incense...but I wonder if that's weird Buddhism or weird animism? but I wonder if that's weird Buddhism or weird animism?